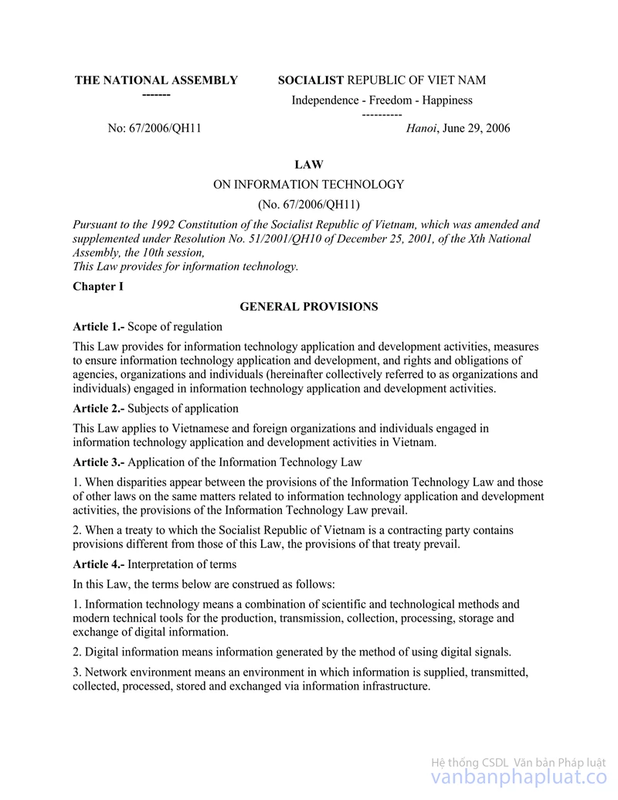 This Decree specifies the management, provision, use of Internet services, online information, and online games, and assurance of information security; rights and obligations of organizations and individuals to the management, provision, use of Internet services, online information, online games, and assurance of information security. 3. Internet exchange point is a system of telecommunication devices installed by an organization or enterprise to provide Internet connection services. 4. 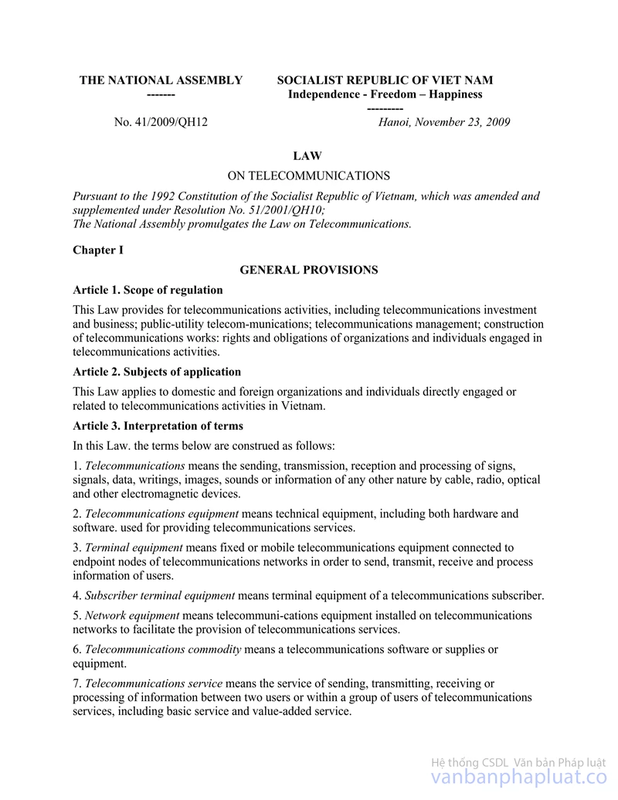 Internet service providers are telecommunication enterprise that provide internet services defined in Clause 2 of this Article. 5. Internet agents are organizations and individuals that provide Internet access services for users under internet agent contracts with Internet access service providers to get commission, or resell Internet access services to reap benefits from price differences. b) Public Internet access points of enterprises are the locations under the management of affiliated units or representatives of Internet service providers where Internet access services are provided for Internet users. c) Public Internet access points in hotels, restaurants, docks, bus stations, coffee shops, and other public places are locations where organizations and individuals may legally provide Internet access services for Internet users. 7. Internet users are organizations and individuals that enter into service contracts with Internet access service providers or public Internet access points to use the applications and services on the Internet. b) Other international domain names, Internet addresses, names and numbers allocated to organizations and individuals in Vietnam by international organizations. 9. Online game services (hereinafter referred to as game services) are the provision of access to the Internet and online games. 10. Online game service providers (hereinafter referred to as game service providers) are enterprises established in accordance with Vietnam’s law that provide game services by establish a system of equipment and the legal use of video games. 11. Gaming centers are places where organizations and individuals may legally provide players with access to the Internet and video games by establishing a system of equipment at such locations. 13. Online information is information transmitted, collected, and processed via the Internet. 14. Public information is online information of an organization or individual that is publicly provided without identifications or addresses of receivers. 15. Private information is online information of an organization or individual that is not publicized by that organization or individual, or only provided for a group of receivers that are identified. 16. Private information is the information associated with the identifications of individuals, including names, ages, addresses, ID numbers, phone numbers, email addresses, and other information defined by law. 17. Information service mean provision of public information for service users. 18. 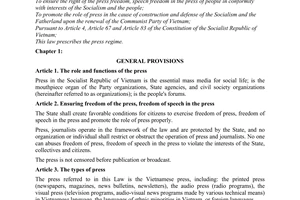 Official sources are the information posted or published on Vietnam’s newspapers or websites of the State according to the laws on press and intellectual property. 19. News is information that is collected from multiple sources about politics, economics, culture, or society. 20. Information system is a combination of telecommunications and IT equipment, including hardware, software, and database serving the storage, processing, transmission, sharing, exchange, provision, and use of information. 21. A website is a system of information used for establishing one or multiple pages of information that are displayed in the form of symbols, digits, text, video, audio, and other forms of information serving the provision and use of information on the Internet. 22. Social networking site is a system of information that provides its users with services such as storage, provision, use, search, sharing, and exchange of information, including the provision of private websites, forums, online chats, audio and video sharing, and other similar services. 23. Information safety is the protection for information and information system from illegal access, use, revelation, interruption, or alteration of information in order to ensure the integrity, security, and utility of information. 24. Information security is to ensure that online information does not threaten national security, social order, state secrets, the lawful rights and interests of organizations and individuals. Article 4. 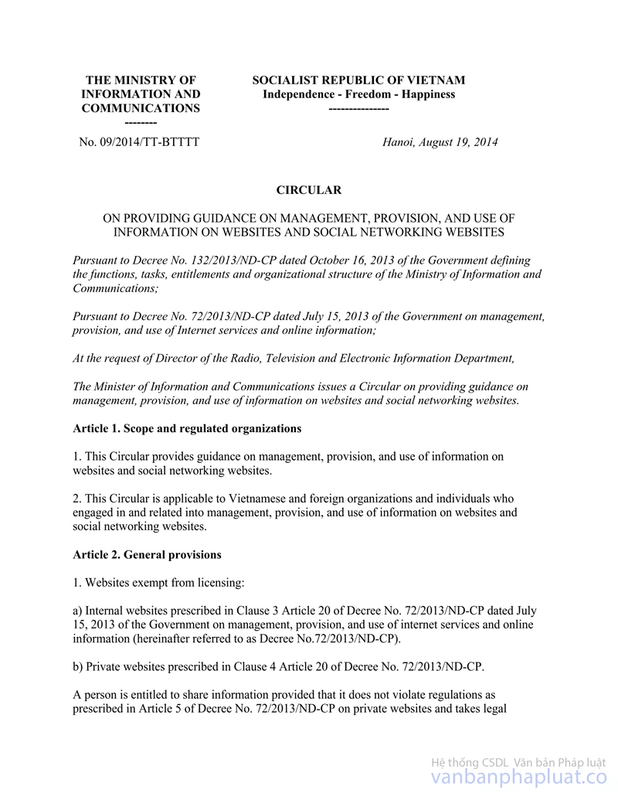 Policies on the development and management of Internet and online information. 1. Encourage the use of Internet in all economic and social activities, especially in education, health care, and scientific research in order to raise productivity, create jobs, and improve the quality of life. 2. Encourage the development of contents and applications in Vietnamese to serve Vietnamese community on the Internet. Enhance the upload of healthy and useful information to the Internet. 3. Develop broadband Internet infrastructure in schools, hospitals, research institutes, libraries, state agencies, enterprises, public Internet access points, and households. Focus on the provision of Internet services in rural areas, remote areas, bordering areas, islands, and areas facing extreme socio-economic difficulties. 4. Prevent the abuse of the Internet to threaten national security, social order and safety, to contradict the code of ethics, traditions, and law, Take measures to protect children, adolescents and young people from negative impacts of the internet. 5. 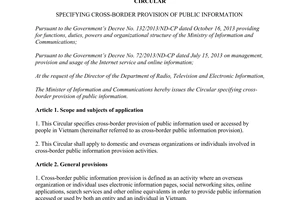 Ensure that only legal information is transmitted, even across the border, to Internet users in Vietnam. 6. 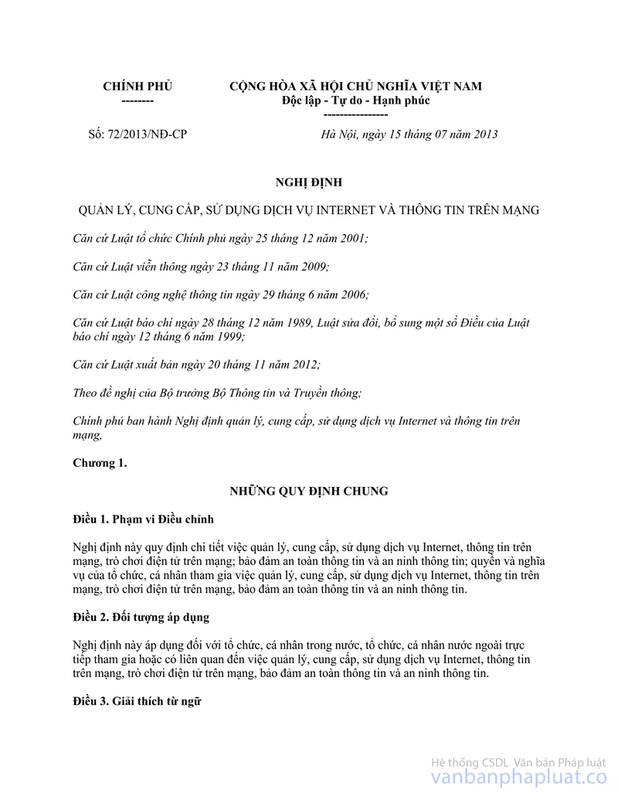 Encourage and facilitate the use of “.vn" domain names, domain names in Vietnamese, and the conversion to addresses using IPv6 technology (hereinafter referred to as IPv6 technology). 7. 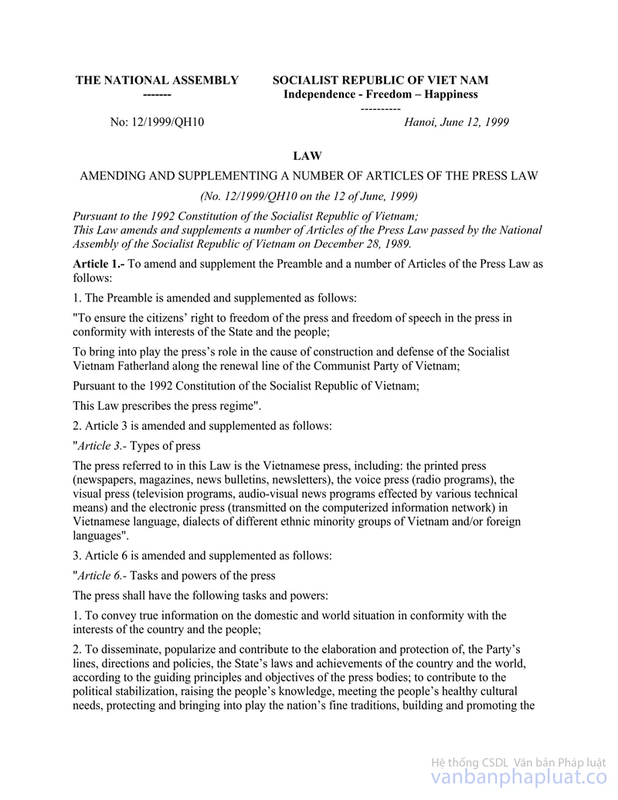 Intensify international cooperation in Internet on the basis of mutual benefits, conformity with Vietnam’s law and the International Agreements to which the Socialist Republic of Vietnam is a signatory. a) Opposing Socialist Republic of Vietnam; threatening the national security, social order and safety; sabotaging the national fraternity; propagating wars and terrorism; arousing animosity and among races and religions. e) Impersonating other organizations and individuals to spread false information, which violates the lawful rights and interests of other organizations and individuals. 2. Illegally obstructing the lawful provision and access to information, the provision and use of lawful services on the Internet of other organizations and individuals. 3. 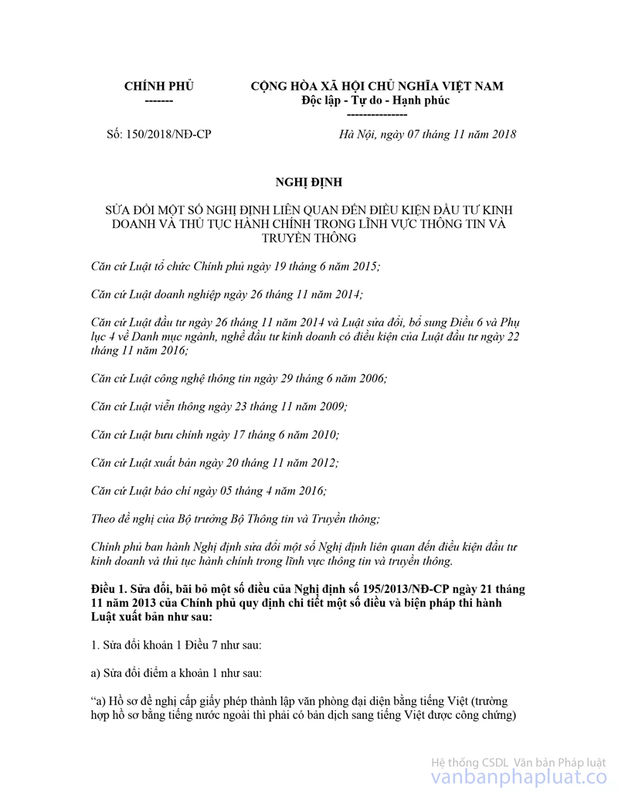 Illegally obstructing the operation of “.vn” domain name system servers (DNS servers), lawful operation of Internet service and online information provision systems. 4. Illegally using passwords of other organizations and individuals, private information, and Internet resources. 5. Creating illegal links to lawful domain names of other organizations and individuals; creating, installing, spreading harmful software or computer virus; illegally accessing or taking control of info systems; making attack tools on the Internet. 1. Enterprises may provide internet services after obtaining the license to provide internet services. 2. 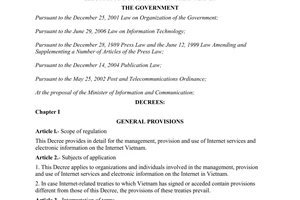 The issuance, adjustment, extension, revocation, and reissuance of the license to provide internet services are provided for in Article 35, Article 36, Article 38, Article 39 of the Law on telecommunications, Article 18, Article 23, Article 24, and Article 28 of the Government's Decree No. 25/2011/ND-CP dated April 06, 2011 o elaborating some Articles of the Law on telecommunications. 2. 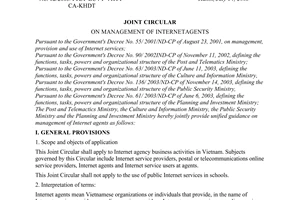 Register the form of Internet agent applications and internet service contracts with the Ministry of Information and Communications (the Vietnam Telecommunications Authority). 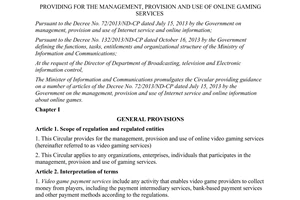 c) The provision of game services must comply with Clause 1 Article 35 of this Decree. 2. Owners of public Internet access points of enterprises are exempt from registering the Internet agent business and signing Internet agent contracts. 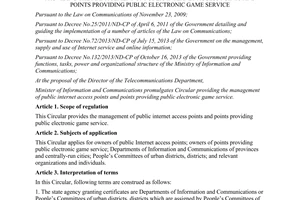 The provision of game services must comply with Clause 1 Article 35 of this Decree. dd) The rights and obligations of owners of gaming centers in Article 36 of this Decree. 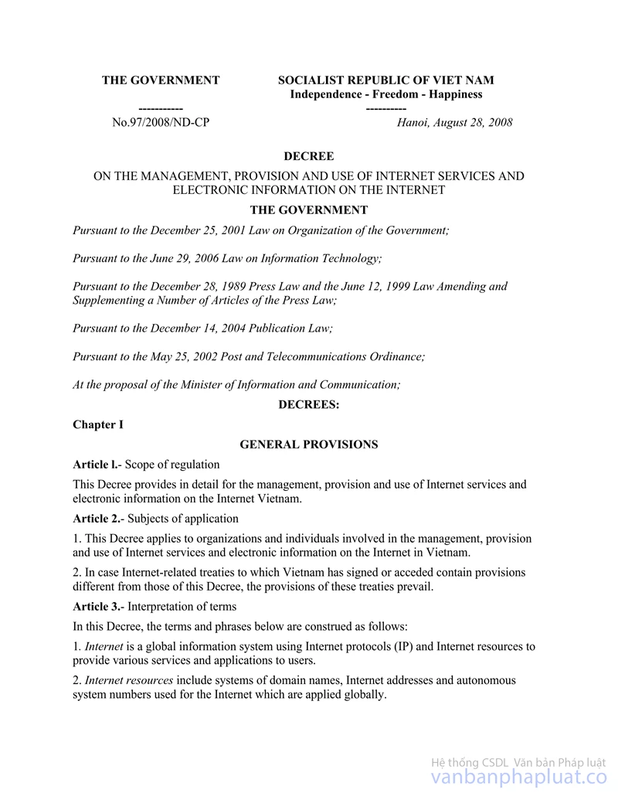 e) Preventing Internet users from using the computers to commit the prohibited acts in Article 5 of this Decree. i) Complying with the regulations on information safety and information security. 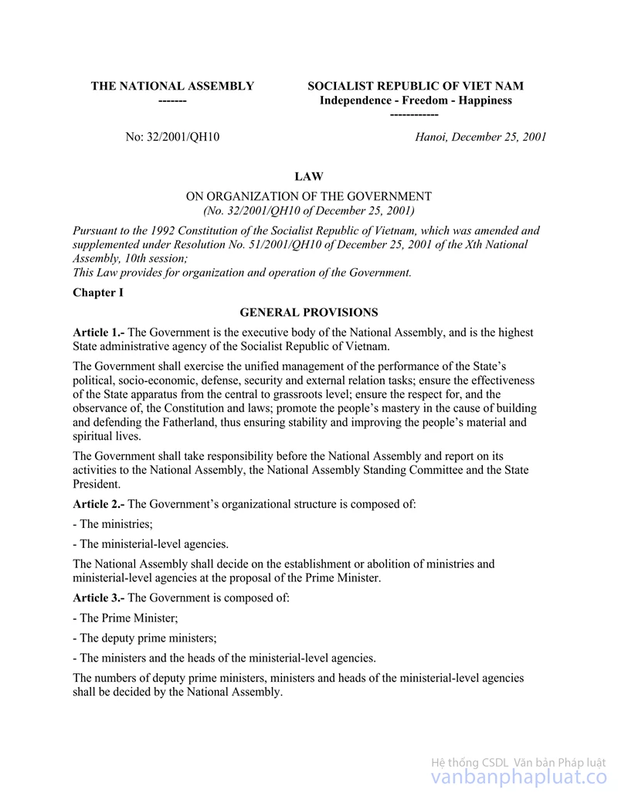 b) The rights and obligations specified in Points a, c, dd, e, h, i Clause 1 of this Article. b) Have the rights and obligations specified in Points a, c, d, e, g, h i Clause 1 of this Article. b) Have the rights and obligations specified in Points a, c, e, h, i Clause 1 of this Article. 1. Using services on the Internet, except for the banned services defined by law. 2. Complying with the opening and closing hours of public Internet access points. 3. Do not resell Internet services in any shape or form. 4. Complying with the information safety, information security, and relevant regulations in this Decree. 1. Internet service providers may connect with the international network, with each other, and Internet exchange points. d) Connect Internet service providers in a non-profit manner to raise the quality and reduce prices. b) Provide polices to enable Internet service providers to connect with each other, with VNIX and other Internet exchange points. 1. 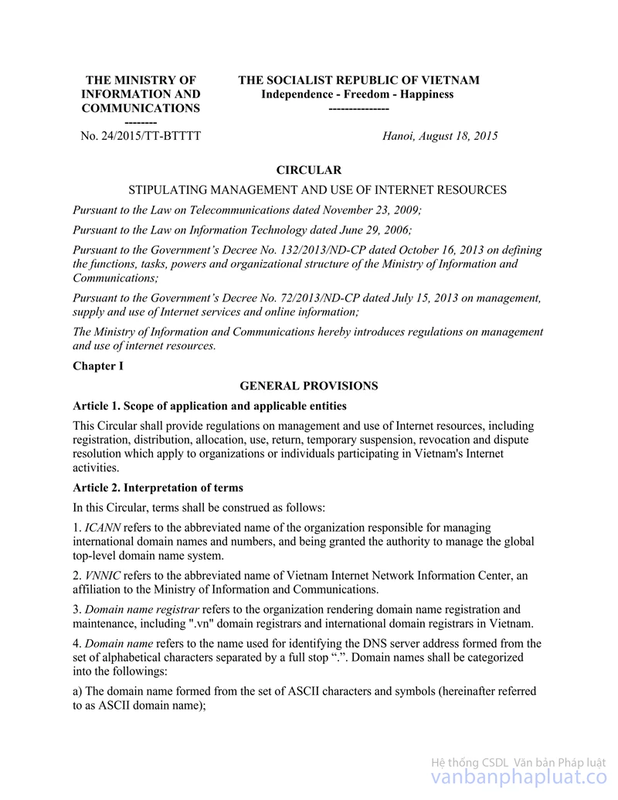 The Ministry of Information and Communications shall manage “.vn" domain names and international domain names allocated to organizations and individuals in Vietnam by international organizations. 2. All organizations and individuals are entitled to register “.vn" domain names and international domain names. 3. 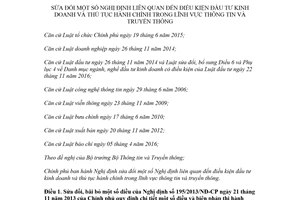 “.vn" domain names shall be registered at domain name registrars. d) Conformity with the regulations on auction and transfer of domain names in the Law on telecommunications. 5. Domain names registered by organizations and individuals must not contain phrases that threatens the national interests or are contrary to social ethics and national traditions; domain names must avoid confusion or distortion due to ambiguity or absence of Vietnamese tone marks. 6. The organizations and individuals other than agencies of the communist party and state agencies must not register and use the domains that are names of agencies of the communist party and state agencies. 7. The Ministry of Information and Communications shall specify the conditions and procedure for registering and revoking “.vn" domain names. 1. “.vn” DNS server is the technical system that ensures the operation of “.vn" domain names on the Internet. The Ministry of Information and Communications (Vietnam Internet Network Information Center) shall establish and operate “.vn” DNS servers. 2. Internet service providers shall cooperate in connecting and routing in order to ensure the safe and stable operation of ".vn" DNS servers. 1. ".vn" domain registrars are enterprises that provide “.vn" domain names registration and maintenance services. 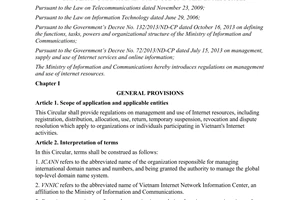 d) Contracts are signed with Vietnam Internet Network Information Center to become a ".vn" domain registrar. i) Making reports, providing information, and cooperate with competent authorities. 1. International domain name registrars are enterprises that provide international domain name registration and maintenance services in Vietnam. c) Contracts are signed with ICANN or an accredited registrar of ICANN to provide international domain name registration services in Vietnam. d) Providing information and cooperate with competent authorities to settle the cases related the international domain names under their management. c) The defendant leases out or transfer the domain name to the plaintiff who owns the brand name or trademark that is identical or confusingly similar to the domain name; leases out or transfer the domain name to the competitor of the plaintiff for self-seeking purposes or for illicit profits. dd) The defendant uses the domain name to tarnish the reputation of the plaintiff, obstruct the business of the plaintiff, or cause confusion and destroy the trust of the public in the brand name or trademark of the plaintiff for unhealthy competition. e) Other cases in which the defendant is proved that his or her using the domain name violates lawful rights and interests of the plaintiff. a) It is proved that the domain name or the corresponding name is used or intended to be used for the provision of real products or services before the dispute arises. d) There is evidence for the legitimacy of the domain name of the defendant. 4. The domain management shall settle the dispute over the domain in accordance with the record of successful conciliation, or the effective decision of the arbitration service, or the effective judgment or decision of the court. 1. 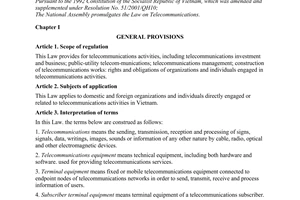 The Ministry of Information and Communications shall register Internet addresses and network codes with international organizations; allocate Internet addresses and network codes to Internet service providers and other Internet address members in Vietnam. 2. Internet service providers may issue the Internet addresses allocated to them to their Internet subscribers. 3. Organizations and enterprises that receive Internet addresses and network codes directly from international organizations must make reports and comply with relevant regulations of the Ministry of Information and Communications. 4. The Ministry of Information and Communications shall specify the conditions and procedure for the allocation, issuance, and revocation of Internet addresses and network codes. 1. IPv6 technology is in the list of prioritized high technologies. The research, production, and import of equipment, software, and application of IPv6 technology shall be given incentives and support according to the Law on High technologies. 2. Internet service providers are encouraged to invest in the development of network systems using IPv6 technology. 3. When state agencies invest in or procure new equipment connected to the Internet, they must ensure that the equipment supports IPv6 technology as prescribed by the Ministry of Information and Communications. 4. 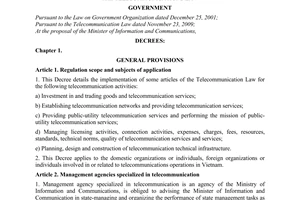 The Ministry of Information and Communications shall cooperate with relevant Ministries and agencies in formulating policies on the support for and the plan for ensuring all telecommunications and IT equipment and software that are produced in Vietnam and imported to Vietnam support IPv6 technology, aiming to totally stopping the production and import of equipment and software programs that do not support IPv6 technology. 5. The Ministry of Education and Training shall provide guidance on the application of IPv6 technology into the training programs of universities and colleges that provide training in information technology and telecommunications. a) Taking responsibility before the law for the accuracy of the registration information; do not infringe the lawful rights and interests of other organizations and individuals. b) Taking responsibility for the management and use of their domain names in accordance with law. 2. Organizations and individuals that use international domain names must send reports to the Ministry of Information and Communications according to Article 23 of the Law on Information technology. The Ministry of Information and Communications shall specify the procedure for reporting the use of international domain names. 3. Organizations that use Internet addresses and network codes must route, use the internet addresses and network codes in accordance with regulations of the Ministry of Information and Communications. 4. Organizations and individuals that use Internet resources must provide information and cooperate with competent authorities at their request. 5. Organizations and individuals that use Internet resources must pay registration fees and Internet resource sustention fee as prescribed. 1. Electronic newspapers in the form of websites. 2. News websites are websites of organizations and enterprises that post news cited from official sources, specify the authors or managing agencies of the official sources, and the time when such information is posted. 3. Internal websites are websites of organizations and enterprises that post information about the functions, tasks, powers, organization structure, services, products, business lines, and other information serving their operation. Those websites do not post news. 4. Private websites are websites established by individuals or via social networking sites to provide and exchange private information. Those websites neither represent other organizations and individuals nor provide news. 5. Specialized websites are websites of organizations and enterprises that provide applications for telecommunications, information technology, radio and television, commerce, finance, banking, culture, health care, education, and other fields. Those websites do not post news. 1. The management, provision, and use of online information in the form of electronic newspapers, electronic publications and online advertisements must comply with the laws on press, publishing, and advertising. 2. The management, provision, and use of online information in the form of social networking sites and news websites must comply with Section 2 Chapter III and relevant regulations of this Decree. 3. The management, provision, and use of online information on mobile networks must comply with Section 3 Chapter III and relevant regulations in this Decree. 4. The management, provision, and use of online information on specialized websites must comply with specialized laws and relevant regulations of this Decree. 5. Organizations and individuals shall take responsibility for the information they store, transmit, provide, or spread online. 6. Private information of organizations and individuals shall be kept confidential in accordance with law. The control of private information online shall be carried out by competent state authorities in accordance with law. c) At the request of competent authorities as prescribed by law. 8. Organizations and individuals engaged in the management, provision, and use of online shall protect state secrets in accordance with law. Organizations and individuals shall encrypt the information classified as state secrets when storing and posting them online. 1. 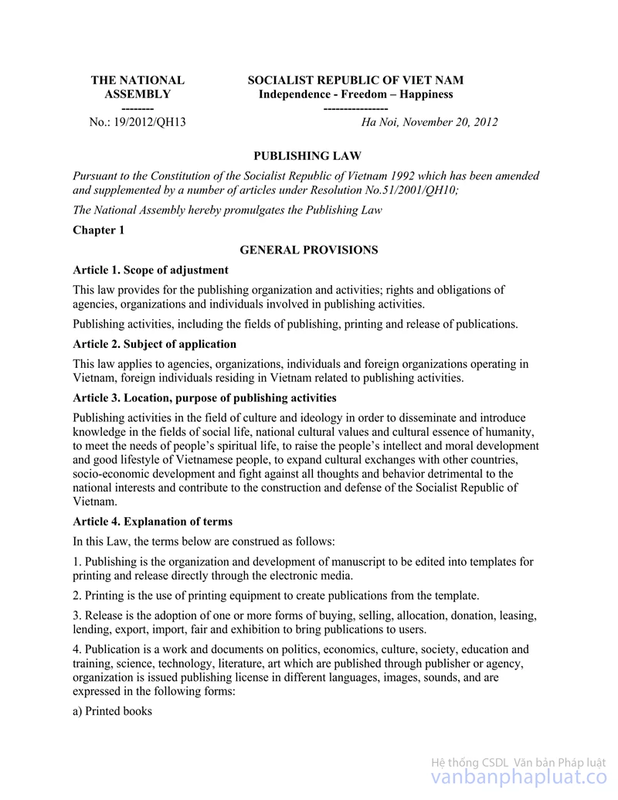 The foreign organizations, enterprises, and individuals that provide public information across the border, which is accessed by Vietnamese people or from people in Vietnam, must comply with Vietnam’s law. 2. 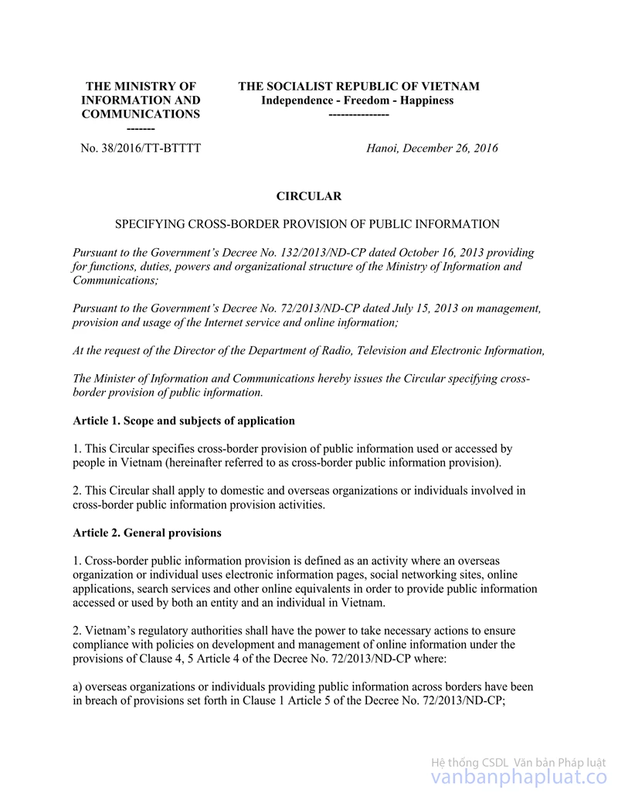 The Ministry of Information and Communications shall specify the provision of public information across the border. 1. 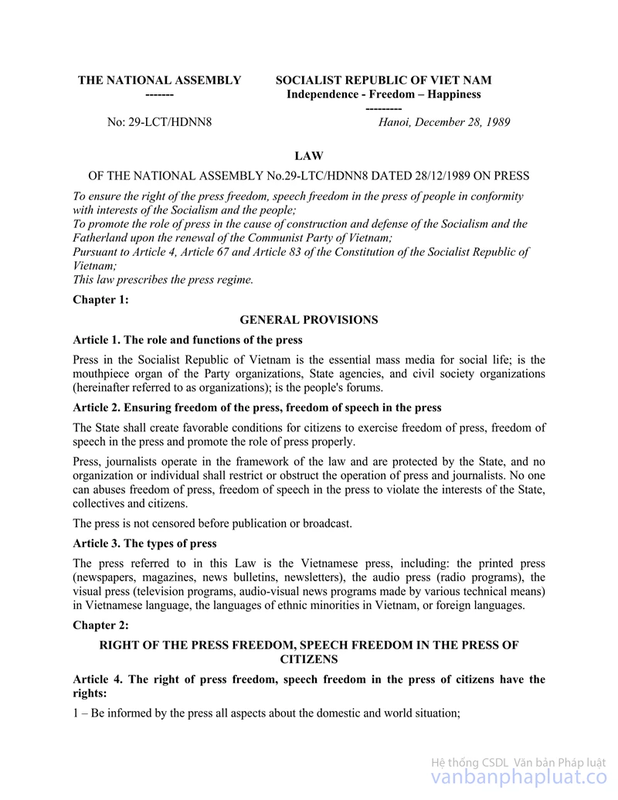 Electronic newspapers in the form of websites may be established and operate in accordance with the laws on press. 2. Specialized websites may be established and operate in accordance with specialized laws and relevant regulations of this Decree. 3. Private websites and internal websites must comply with the regulations on registration and use of Internet resources, and relevant regulations of this Decree. 4. Organizations and enterprises shall only establish news websites and social networking sites after obtaining the license to establish news websites and license to establish social networking sites. d) Measures are taken for ensuring information safety and information security. 6. The duration of the license to establish news websites or license to establish social networking sites depends on the demand of the organization or enterprise, and shall not exceed 10 years. 7. The Ministry of Information and Communications shall issue license to establish social networking sites. 8. 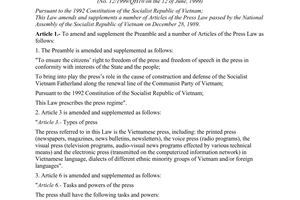 The Administration of radio, television and electronic information - the Ministry of Information and Communications shall issue licenses to establish news websites to press agencies, diplomatic and consular agencies, organizations affiliated to central government, religious organizations that operate legally in Vietnam, governmental and non-governmental organizations that legally operate in Vietnam; Services of Information and Communications, and other organizations prescribed by the Ministry of Information and Communications. 9. Services of Information and Communications shall issue licenses to establish news websites to the organizations and enterprises not being mentioned in Clause 8 of this Article. 10. 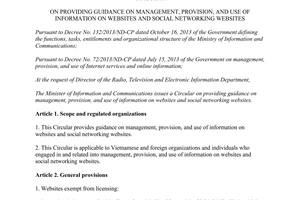 The Ministry of Information and Communications shall specify the conditions and procedures for issuing, adjusting, extending, revoking, and reissuing licenses to establish news websites and licenses to establish social networking sites. 11. The Ministry of Finance shall cooperate with the Ministry of Information and Communications in imposing the fines for the issuance of licenses to establish news websites and licenses to establish social networking sites. 4. Supervise and eliminate improper information according to Article 5 of this Decree when it is found or at the request of competent authorities. 7. Making reports and facilitate the inspections carried out by competent authorities. 3. Take measures for protecting private information of users; notifying users of their rights, obligations, and risks when storing, exchanging, and sharing information online. 6. Cooperating with competent authorities to eliminate or prevent information that violates Article 5 of this Decree at their request. 9. Registering, storing, and managing personal information of the persons that establish personal websites and other information providers on social networking sites according to regulations of the Ministry of Information and Communications. Ensure that only the persons that provide accurately their personal information are allowed to establish personal websites or provide information on social networking sites. 10. Making reports and facilitate the inspections carried out by competent authorities. 1. Using services of the social networking sites, except for the banned services defined by law. 2. Having their private information kept confidential in accordance with law. 4. Taking responsibility for the information stored, provided, and shared on social networking sites, or spread via direct links. 1. Organizations and enterprises may only provide information services on mobile networks after registering the provision of information services on mobile networks as prescribed by the Ministry of Information and Communications. 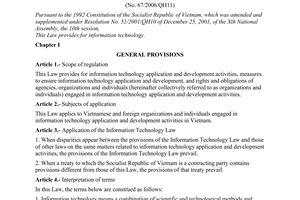 a) The organization or enterprise is established within Vietnam’s law and is assigned or licensed to provide online information services. c) Measures are taken for ensuring information safety and information security. 3. 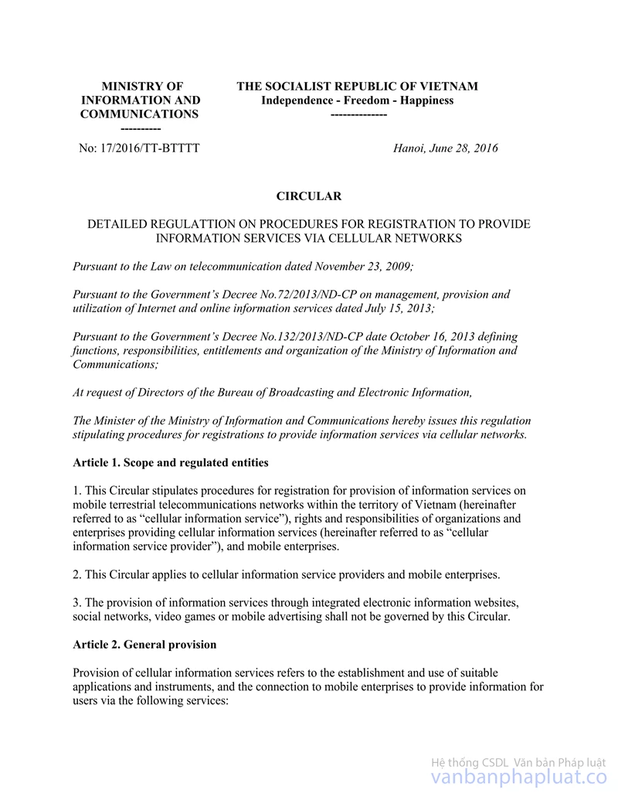 The Ministry of Information and Communications shall specify the procedure for registering the provision of information services on mobile networks, the connection between providers of online information services with mobile telecommunications companies, and other regulations related to the management, provision, and use of information services on mobile networks. 1. Installing equipment systems at the locations to which they are entitled, hiring telecommunication transmission lines to connect to telecommunication enterprises. Article 29. 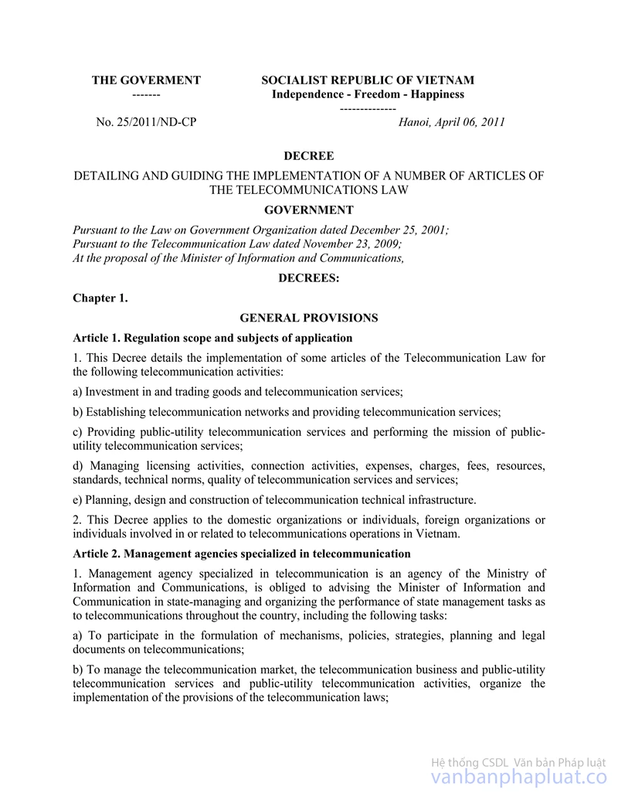 Rights and obligations of mobile telecommunication enterprises. e) Avoid discrimination by connection, prices, payment, technical regulations and standards, quality of networks and telecommunications services. 3. Suspending or disconnecting with providers of information services on mobile networks that violate the regulations on service provisions at the request in writing of competent authorities. 4. Cooperating with providers of information services on mobile networks in settling complaints or customers’ disputes over charges and service quality. 5. Making reports and facilitate the inspections carried out by competent authorities. 4. Making complaints or denunciations if the services provided are not consistent with the services announced or promised by the service provider. - Video games that are downloaded from the Internet without the interaction among players and between players and the game server (hereinafter referred to as G4 games). b) Classification by players’ ages and game contents. The Ministry of Information and Communications shall specify the classification of video games by ages. 2. Enterprises may provide G1 games after obtaining the License to provide game services and the Decision to approve game contents issued by the Ministry of Information and Communications. 3. Enterprises may provide G2, G3, and G4 games after obtaining the Certificate of Registration of game service provision and announcement of service provision of every game. 4. 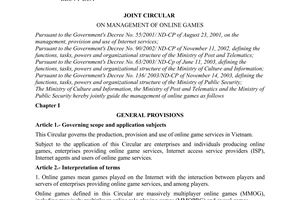 Foreign organizations and individuals that provide online game services for Vietnamese users must establish enterprises in accordance with Vietnam’s law in accordance with this Decree and the laws on foreign investment. a) The enterprise is established in accordance with Vietnam’s law and has registered the provision of online game services. 2. The validity period of the License to provide game services depends on the request of the enterprise and shall not exceed 10 years. - Do not contain images or sounds that depict suicide, use of drug, alcohol and tobacco, terrorism, child abuse, child trafficking, and other wrongful or unlawful acts. - Satisfy other requirements of the Ministry of Information and Communications. c) Meet the technical requirements for providing game services imposed by the Ministry of Information and Communications. 4. 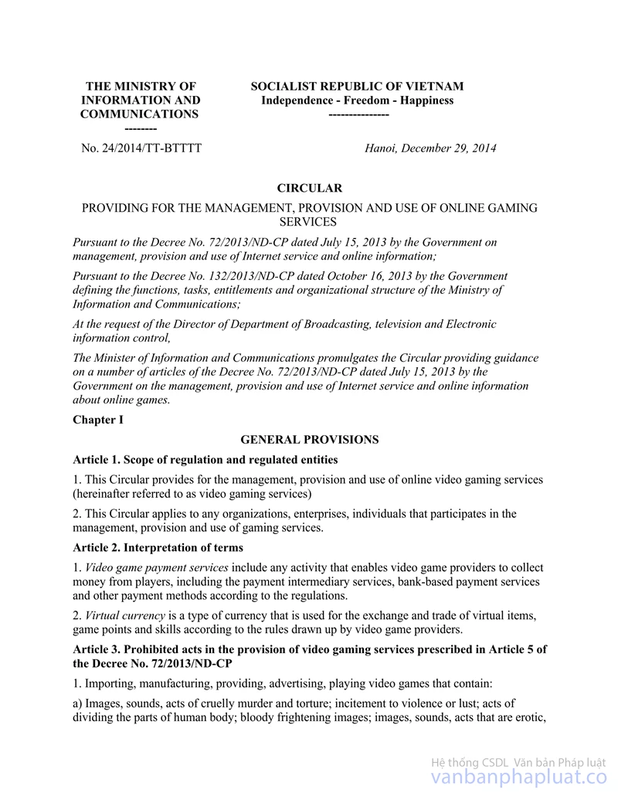 The Ministry of Information and Communications shall specify the conditions and procedures for issuing, adjusting, extending, revoking, reissuing the License to provide game services and the Decision to approve game contents. 5. The Ministry of Finance shall cooperate with the Ministry of Information and Communications in imposing fees for licensing game services and assessing video game contents. 2. The Ministry of Information and Communications shall specify the conditions and procedure for registration and announcement of game service provision. d) The rules for settling complaints and disputes among the players, between the players and the service provider. 11. Sending periodic and unscheduled reports to the Ministry of Information and Communications at its request. 12. Facilitating the inspections carried out by competent authorities. 1. Organizations and individuals may only open gaming centers after obtaining the Certificate of eligibility to open gaming centers. g) The fee of issuance of the Certificate of eligibility to open gaming centers is paid. 3. The Ministry of Information and Communications shall specify the procedure for issuing, adjusting, extending, revoking, and reissuing the Certificate of eligibility to open gaming centers. 4. 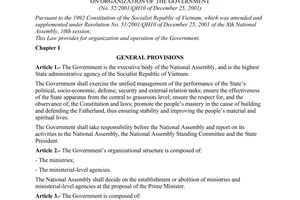 People’s Committees of central-affiliated cities and provinces shall assign Services of Information and Communications or district-level People’s Committees to preside the issuance, adjustment, revocation, extension, and reissuance of the Certificate of eligibility to open gaming centers, and direct the inspections and impositions of penalties against the violations committed by local gaming centers. 5. The Ministry of Finance shall cooperate with the Ministry of Information and Communications in imposing the fee for the issuance of the Certificate of eligibility to open gaming centers. 10. Facilitating the inspections carried out by competent state management authorities. 7. Having their interests protected by game service providers in accordance with the rules of video games and the rules for settling complaints and disputes posted on the website of the provider. ASSURANCE OF INFORMATION SAFETY AND INFORMATION SECURITY. 1. Providers and users of Internet services and online information are responsible for ensuring information safety and information security within their information system; cooperating with competent authorities, other organizations and individuals in ensuring online information safety and information security. 2. Measures for ensuring online information safety and information security must be regularly taken and comply with technical regulations and standards of information safety and the laws on telecommunications and Internet service quality. Article 39. Responsibility of the State for information safety and information security. g) Specify the registration, storage, and use of personal information of individuals that post information on social networking sites, G1 game players, and user of other services on the Internet; the comparison of such information with the identity database of the Ministry of Public Security. e) Organize the development and use of identity database to connect with providers of online services to verify personal information serving the management, provision, and use of online information and services. c) Conduct inspections, assessments, and certification of conformity of products using information security codes. c) Provide training in information safety in universities and colleges that provide training in information technology and telecommunications. 5. The Ministry of Labor, War Invalids and Social Affairs shall take measures for protecting children, adolescents and young people from harmful info and application on the Internet. 6. Ministries, ministerial agencies, and Governmental agencies, within their competence, shall cooperate with the Ministry of Information and Communications and the Ministry of Public Security in state management of information safety and information security. 7. Provincial People’s Committees, within their competence, shall perform state management of information safety and information security. 1. Certification of conformity of information system with information safety regulations (hereinafter referred to as conformity certification) is the certification that the information system is conformable with technical regulations promulgated by the Ministry of Information and Communications and mandatory information safety standards established by the Ministry of Information and Communications. 2. Declaration of conformity of information system with information safety regulations is the organization or enterprise declaring the conformity of the information system with the technical regulations and standards on information safety. 3. Owners of information systems shall carry out conformity certification and conformity declaration in accordance with regulations of the Ministry of Information and Communications. 4. Conformity certification bodies are the units accredited or assigned by the Ministry of Information and Communications to carry out conformity certification. 5. The Ministry of Information and Communications shall specify the certification and declaration of conformity with regulations on information safety; make a list of information systems that need conformity certification and declaration; appoint and accredit certification bodies. 1. Information safety services are to protect information and information systems, including consultancy, inspection, assessment, supervision of information systems, and relevant services. 2. The Ministry of Information and Communications shall provide guidance on the provision of information safety services. 1. Classification of information systems are the assessment and determination of importance of such information systems to the entire information and communication infrastructure, economic and social development, national defense and security for providing solutions for assurance of information safety and information security. 2. The Ministry of Information and Communications shall cooperate with the Ministry of Public Security, relevant Ministries and agencies in formulating and organizing the regulations on classification of information systems, making the list of information systems of national importance, requirements for information safety and information security of information systems of national importance. 1. Computer emergency response is to handle and resolve the accidents that threaten online information safety. 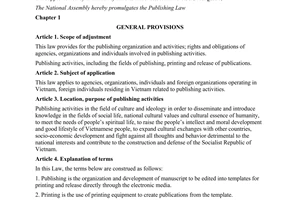 c) Seek cooperation with Vietnamese and international organizations and enterprises. 4. The Ministry of Information and Communications shall formulate and organize the implementation of regulations on coordinating network emergency response. 1. Deploying technical systems and techniques to ensure information safety and information security. 2. Instructing Internet agents, public Internet access points, and gaming centers to take measures for ensuring information safety and information security. 3. Preparing premises, connection ports, and necessary technical conditions for competent authorities to ensure information safety and information security at the request of the Ministry of Information and Communications and the Ministry of Public Security. 4. Promulgating and implementing internal regulations, procedures for operating, providing, using services, and regulations on cooperation with the Ministry of Information and Communications and the Ministry of Public Security in assurance of information safety and information security. 1. This Decree takes effect on September 01, 2013. 2. The Government's Decree No. 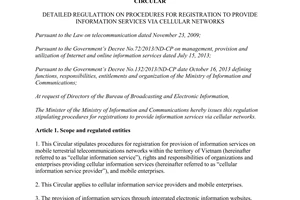 97/2008/ND-CP dated August 28, 2008 on the management, provision, use of internet services and electronic information on the Internet is abrogated on the effective date of this Decree. The Joint Circular No. 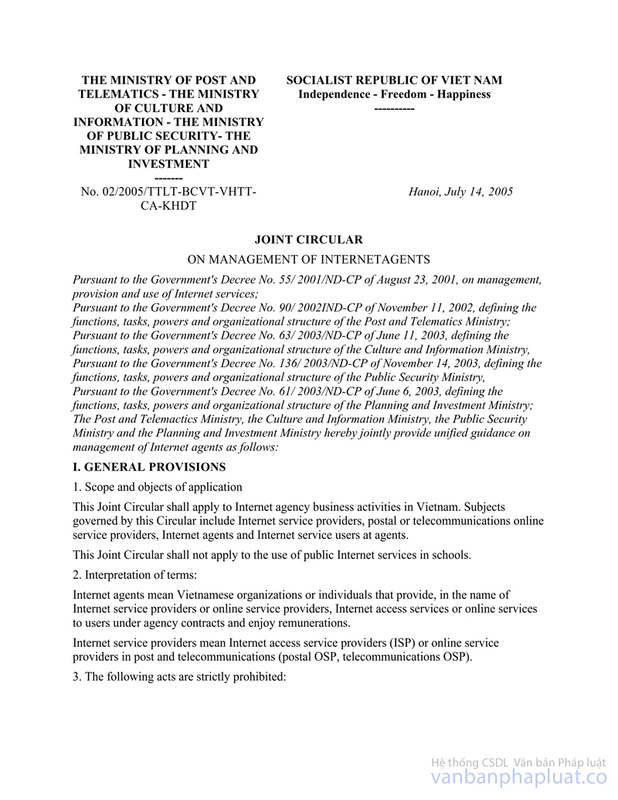 02/2005/TTLT-BCVT-VHTT-CA-KHDT dated July 14, 2005 of the Ministry of Post and Telecommunications, the Ministry of Culture, Sports and Tourism, the Ministry of Public Security, and the Ministry of Planning and Investment on management of Internet agents, and the Joint Circular No. 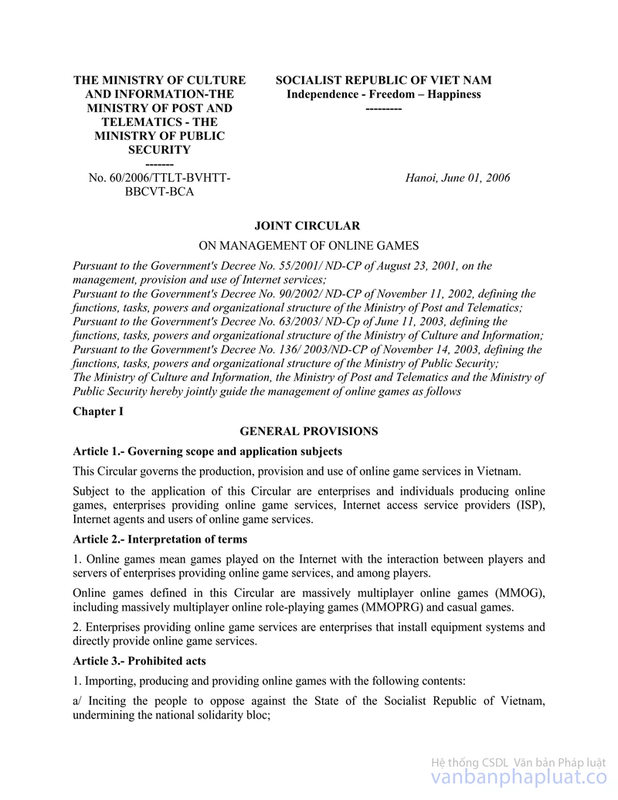 60/2006/TTLT-BVHTT-BBCVT-BCA dated June 01, 2006 of the Ministry of Culture, Sports and Tourism, the Ministry of Post and Telecommunications, and the Ministry of Public Security on the management of online games. The Minister of Information and Communications are responsible for providing guidance and inspecting the implementation of this Decree. The ministers, Heads of ministerial agencies, Heads of Governmental agencies, the Presidents of People’s Committees of central-affiliated cities and provinces, relevant organizations and individuals are responsible for the implementation of this Decree. Joint circular No. 02/2005/TTLT-BCVT-VHTT-CA-KHDT, on management of internetagents, passed by the Ministry of Culture and Information, The Ministry of Planning and Investment, the Ministry of Post and Telecommunications, the Ministry of Public Security. Decree No. 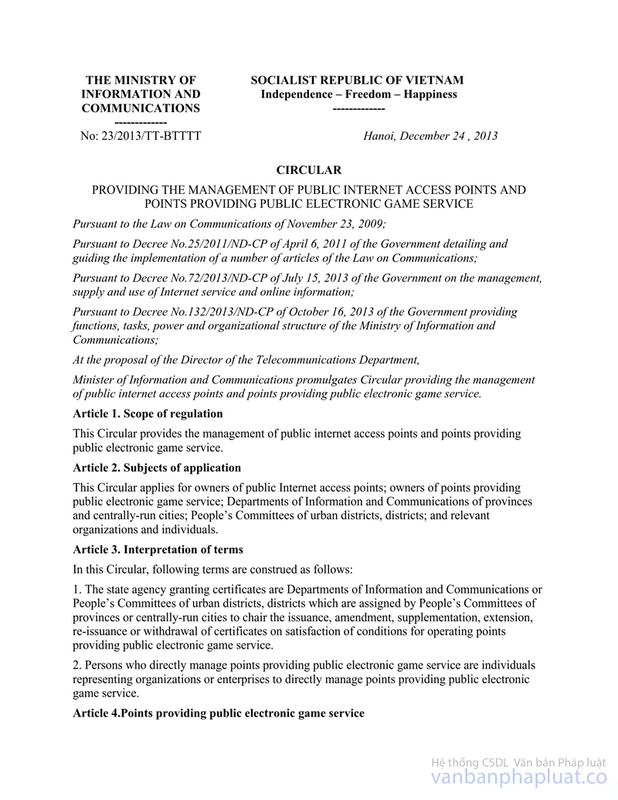 97/2008/ND-CP of August 28, 2008, on the management, provision and use of internet services and electronic information on the internet.